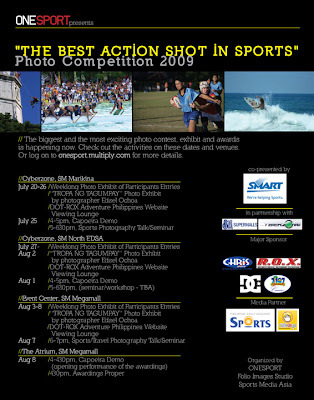 Onesport is presenting a Photo Exhibit entitled "The Best Action Shot in Sports" which will be held in 3 SM Malls from July 20 to August 9, 2009. 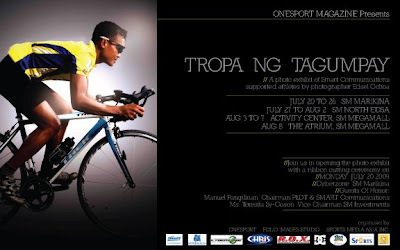 The exhibit is showcasing the works from Smart's Tropa ng Tagumpay and the entries from the Onesport Best in Action Shot in Sports Photo Contest. The awarding for the photo contest will be held at The Atrium of SM Megamall on August 8, 2009 at 4pm to 8pm. For more information, please log on to http://onesport.multiply.com.